These local art-rock visionaries are launching a tour at a party that also celebrates the release of a willfully eccentric single, “Haunt, the Cartoon Heart,” that effortlessly picks up where the songs on “Blasterpiece” — which we’ve often described as “like Frank Zappa writing for Queen” — left off. And to be clear, we understand that it most likely took a lot of effort. But part of the key to their appeal is they make it look easy, no matter how much virtuosity and creativity they work into the mix. In Pound For The Sound, New Times gets technical with local musicians about what gear they use to create their signature style. Bear Ghost’s Ryan Abel is a diehard fan of two things: Elvis Presley and Disney. The guitarist has had eight annual passes to Disney, and he’s currently on a three-year hiatus as he eagerly awaits the 2019 opening of “Star Wars Land.” In the meantime, he has plenty of time to rock with his band. Abel is a great player with great ideas, and he’s a ton of fun to watch on stage. The dude never stops moving. Born in Arizona, Abel’s family moved around a lot during his childhood. During that time, he started playing on piano at age 7 and he was really into bands like Jackson 5 and Hanson. Eventually, his family settled back in Phoenix, and he attended a small charter school called Sequoia in Mesa. At 13, he made the switch to guitar because he was listening to and emulating heavier, piano-free music. He was always into writing, recording his songs to tape with his basic multi-tracking setup back in his teenage years, but he was doing it solo. And the young writer wanted to play with others. While attending Sequoia, Ryan really found the world of music he’s still part of today. He was in a School of Rock-type of program with other students. There, he built up a network of musicians, most of whom he continues playing with today. 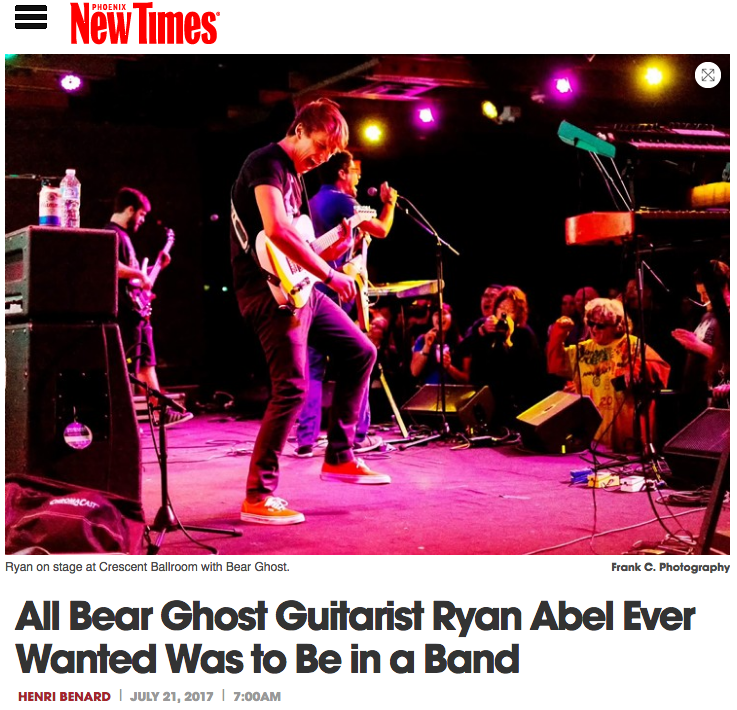 In fact, he has really only played with two groups of people in his life, and Bear Ghost is one of those groups, going seven years strong now. You can catch Abel, and the rest of Bear Ghost, live in action on Saturday, July 22, at Crescent Ballroom for Wyves’ vinyl release show. With the show coming up, New Times talked with the guitarist about his sound, childhood gear, and music lessons. New Times: What’s the secret weapon of your sound? And how did that help you find your “signature” tone? Ryan Abel: I feel like the secret weapon to my sound is the fact that I goof off so much on stage. I know that sounds silly, but the fact that I move around so much requires me to keep my setup pretty simple to minimize pedal dancing. As such, I’ve been narrowed down to two gain settings and a clean channel. I just run through my Orange Micro Terror with low gain, and max volume. So it’s clean, but can get a little spicy when I really lay into the strings. Then I have a Boss Super Overdrive pedal that I use for any distortion parts. And to make the more “bangin’” riffs really shine, I use the push switch on my HH Telecaster to activate the dual humbuckers as opposed to just the outside coils. So I suppose, it’s just one gain setting for chords, and I use my guitar as the second gain setting for maximum riffage. What’s your favorite piece of gear in your collection and why? Honestly, my favorite piece is my newest addition, and that’s the aforementioned Orange Micro Terror. I do not understand the tone I get out of this thing at all. It’s got a valve preamp, but a solid state output. And I guess growing up, I’d only heard people dump all over solid state amps, so I wasn’t expecting to be so enchanted with it. Plus, after years of lugging around a ludicrously heavy Blackheart half stack, the weight of the Micro Terror is really refreshing since it’s the size of a brick. Any special pieces of gear acquired over the years? Any special story, or stories, behind your collection of tools? Weirdly, the most sentimental piece of gear I have is something that I don’t personally even use. My first instrument ever was a Roland keyboard I got for Christmas when I was 9. And it is the same keyboard we still use on stage to this day, 20 years later. It’s got change rattling around in it and I feel like it’s missing more keys than it has. It still has worn out stickers on most of the remaining keys telling you which note they are, and I think we only use two sound effects on it. The song “Gypsy” is just awesome. It actually reminds me of Queen’s “Bicycle” in the best of ways, so many crazy changes that all feel perfect. What was your role for recording and what gear did you on this track? Thank you, kindly! I used next to no gear on this track. Just a borrowed acoustic guitar, a kazoo from the dollar store, and my astonishing vocal prowess. Gypsy was a song that my fellow guitarist, Tomtom, was playing around with for awhile, and my biggest contribution to the song was convincing him that we could pull it off in Bear Ghost. It’s unlike anything else we’ve written and consequently it is one of my favorite things we’ve done. Aside from playing rhythm guitar, I mostly helped with backing harmonies, and the kazoo harmonies in the bridge. I just want everyone to know that the bit about my vocal prowess was a joke and that I am clearly hilarious. You had said that you have never had a guitar lesson in your life, a decision you wish you could change. How do you feel this decision has impacted your career as a musician? I just feel that with lessons, I would have written better music sooner. When learning to play when I was a kid, I would listen to songs and try and listen for every individual note in a chord and try and replicate it, and that’s how I learned to play chords. And for the longest time, I had no idea what chords I was playing. So I mostly stuck with power chords and riffs for the first 6 years of my guitar playing, which is not a good way to advance your skill set. With lessons, I could have gotten to the point I’m at now, probably within those first 6 years. 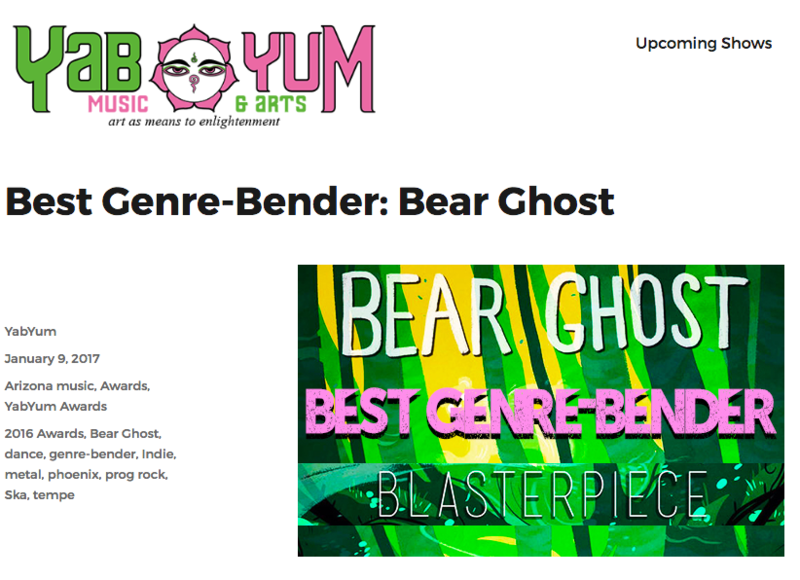 Bear Ghost is performing at Crescent Ballroom this Saturday in support of Wyves vinyl release show. Any words you wish to share with fans about the night? Only that I’m insanely excited and honored to be a part if this show. This will be the last time that we play certain staples of our set as we will revamp and regroup after this, so come out and enjoy tons of rock ‘n’ roll with bands that I adore, and buy the new Wyves vinyl. 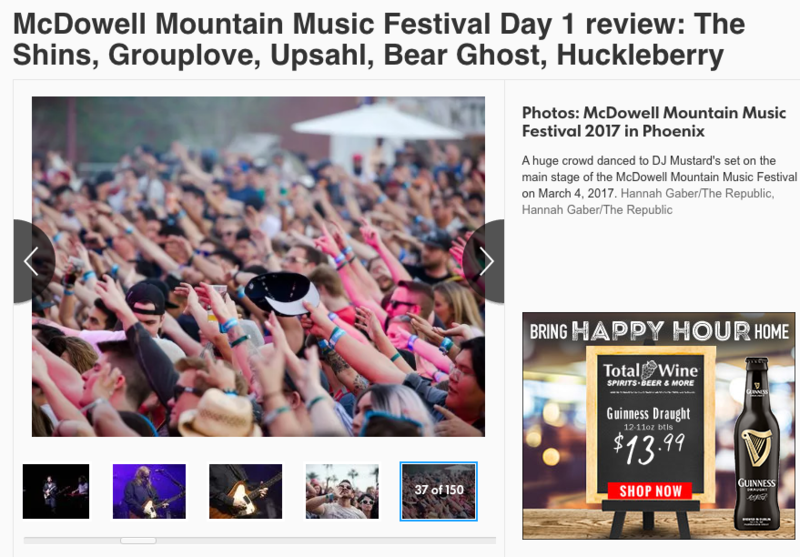 The lineup at Hance Park for the McDowell Mountain Music Festival had some hits and misses, but oh did the hits hit hard. Upsahl returned to Hance Park for the band’s second M3F performance, this time taking full advantage of the big stage with striking visuals, a fuller sound and a stronger set list. Then, there was Bear Ghost. Perhaps the greatest local act of the weekend and definitely the most memorable, the band stunned with liveliness, personality and movement. Through diverse originals and a Queen cover, each vocalist nailed every pitch. The full band enhanced each member’s ability to keep the early crowd fully engaged, even running and spinning across the relatively small stage. After a lackluster performance by Bob Moses, in which vocalist Tom Howie failed to escape his self-assigned box on stage, The Record Company turned the night around. With the simplest introduction — “We are The Record Company and we play rock and roll” — vocalist Chris Vos went haywire with a harmonica, maintaining impressive vocal control through a multitude of leaps into the air. One of the most electrifying parts of the set came with “Feels So Good,” in which instrumentals consistently boosted the crowd’s excitement from a brilliant guitar riff to an energetic full-band crescendo. Vos further proved his talents by transitioning his pure rock voice into falsettos for “Off The Ground” without failure. Following a gorgeous performance by Heaps n Heaps, The Shins unfortunately caused the energy of the night to plummet. Despite a great entry, beautiful songs and a pitch-perfect rendition of “Simple Song,” the set never became much more than mediocre. It was an anticlimactic headlining performance that led the crowd to thin, with the minimalistic “Gone For Good” and lively tunes of “Phantom Limb” as highlights. By the time “New Slang” came on in the encore, I was already tuned out and only mildly entertained by the straightforward performance. I arrived late into Day 2, but with enough time to pinpoint my two favorite sets of the weekend: Chromeo and Flume. Chromeo opened with “Night By Night,” in which strobe lights, fog and more built into frontman David Macklovitch’s constant appeasing of the crowd. With “Over Your Shoulder,” the duo convinced likely 100 people to sit on their friends’ shoulders for the entirety of the song before Macklovitch ran into the pit to reach the crowd and the band played a guitar duet back to back. The most engaging parts of the set came with the closing “Fancy Footwork,” which was the right amounts of cheesy and energetic in one performance. Flume was a perfect headliner. His entry was even more dramatic than Chromeo’s entire set, with a black curtain dropping to the ground after a lengthy electric intro. Visuals ranged from slithering snakes to sunray-like lights. Flume transformed songs like Lorde’s “Tennis Court” and his own “Never Be Like You” into experiences. 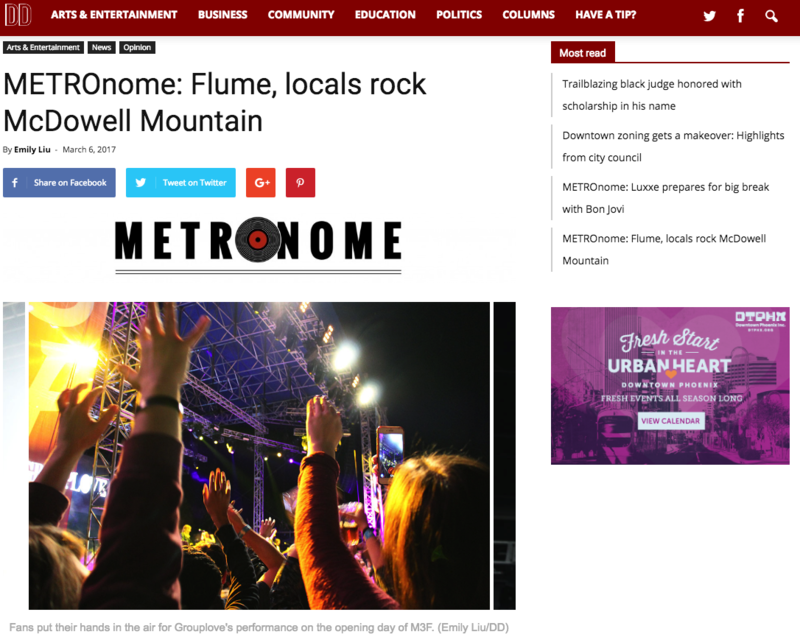 While Porter Robinson brought jaw-dropping graphics last year, Flume proved his superiority by displaying a complete knowledge of every beat of his songs and remixes — dancing in perfect tune and engaging attendees before anyone could stop paying attention. Whiskey Myers and the valley’s own Wyves and CooBee Coo took home the gold on March 5, while legendary jam band musician Warren Haynes took home a close silver for not only giving a solid performance with his headlining band Gov’t Mule, but being featured in Railroad Earth’s third M3F performance as well. Pure rock band Whiskey Myers fought to be remembered with some of the strongest vocals and my favorite guitarist of the weekend. John Jeffers delivered solo after solo, which climaxed as he led a crescendo into all four guitarists rocking at the front of the stage together for a memorable set. Whiskey Myers could have been any jam band, but their cohesion allowed every member to be featured and contribute a crucial element to the set. Wyves was truly outrageous in the best ways, bringing a performance that literally had its vocalist on the ground as he played harmonica and in the crowd as he sang. Closing out the second stage, CooBee Coo brought the grit of rock and soul of experienced musicians to create the fullest sound I heard from any local band. They deserved the same pre-headliner slot, but on the big stage. Next year, I hope they get it. Then they turned around and covered Queen’s “Don’t Stop Me Now.” Doing a song Freddie Mercury sang is a fool’s errand, really. But Thomas Knight nailed it in a truly awe-inspiring display of vocal talent. They also turned in a crowd-pleasing cover of “I Wanna Be Like You” from Disney’s “Jungle Book,” one of several songs that had guitarist Ryan Abel, whose enthusiasm was beyond contagious, spinning in circles on one leg, and “Island Swing” from Donkey Kong because that’s just the kind of wildly entertaining guys they are. If you haven’t seen them live, it’s time you did yourself a favor. The feisty Phoenix four-piece known as Bear Ghost creates a veritable smorgasbord of sound on their 2016 release, Blasterpiece. 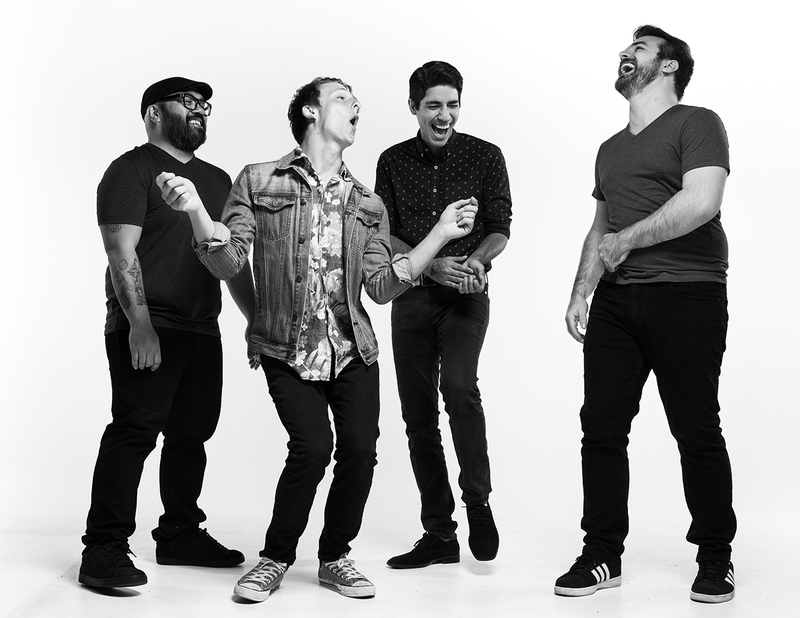 Delivering a high-energy funk, Bear Ghost offers fluidly fuses elements of various genres for a totally unique and unified sound. If you spend some time with Blasterpiece, and really delve into the musical permutations from start to finish, you’ll hear elements drawn from varying genres stretching from prog-rock, chiptunes, and ska all the way to indie, chamber pop, carnival music, and beyond. Bear Ghost has a penchant for the theatrical and their powerhouse sound comes through strong on every track. Blasterpiece, recorded by Jeremy Parker at Premier Studios, was released back in February and can be found through Bandcamp (here or below). And, if you haven’t already, make sure you head out to see Bear Ghost live as soon as opportunity presents itself. The energy you hear on the album carries through to a live setting splendidly.